Preparing a tall glass of fresh homemade pineapple juice is much easier to do than most people would expect. There are many health benefits to drinking raw pineapple juice, as it contains many more vitamins and nutrients than regular pasteurized store bought juice. Fresh pineapple juice can be consumed as a beverage, used as a marinade, or added to a variety of dinner and dessert recipes. In the paragraphs below, we will walk you through the whole process of preparing and juicing a pineapple. You will obviously need a juice machine, as grinding pineapple in a blender or food processor will not adequately extract the juice, and leave a very pulpy paste like substance that can hardly be considered a liquid. If you have any questions at all about juicing a pineapple, then please feel free to send us an email, as we have been making fresh pineapple juice at home for years. To begin first you will need to take out a cutting board and a very sharp serrated edge-cutting knife. Next you will want to remove the thick stem or green upper stock from the fruit. Moving right along, next cut the top and bottom off the pineapple, and then discard the two half inch thick pieces. Next stand the pineapple upright, and trim off the outer skin in strips, cutting deep enough to remove the pineapple seeds in the process. Continue trimming the pineapple until all of the skin has been removed. Next take out a potato peeler and dig out any seeds left in the pineapple flesh. You are now ready to begin cutting the pineapple into half inch thick slices. Once the whole fruit has been sliced, cut the small hard center core piece from each individual slice. Discard the core, and then place the finished pineapple off to the side. For the juicing process, first you will need to take out your juice machine and plug it in. Be sure to give the machine a quick inspection, just to make sure it's clean and sterile, and does not contain any inner debris. Next place a tall juice glass under the machine spout, turn on the juicer, and begin feeding pineapple slices into it. You may need to cut your pineapple into narrow slices beforehand, it really depends on how wide your machine entry point is. You will want to juice the whole pineapple, which should yield a decent amount of juice, especially if the fruit is really ripe. Once your glass is full, turn off the machine. Next take out a long swizzle stick, and then give the finished juice a couple of quick stirs. If you feel the finished beverage is too acidic or sour, simply add in a teaspoon or organic bees honey to sweeten it up. Raw pineapple juice is extremely healthy to drink. It contains large volumes of vitamin C, vitamin B6, folate, niacin, thiamine, riboflavin, calcium, potassium, and even zinc. Pineapple juice does contain large volumes of natural sugar as well, and although this sugar is healthy to consume, diabetics should avoid it. In addition to containing large volumes of essential vitamins and nutrients, pineapple juice also contains an enzyme called bromelain. This proteolytic enzyme helps break down protein, and for that reason the juice makes the perfect meat tenderizer. The enzyme is only contained in fresh or raw pineapple juice, as canning or pasteurizing the juice will break it down to the point of being ineffective. 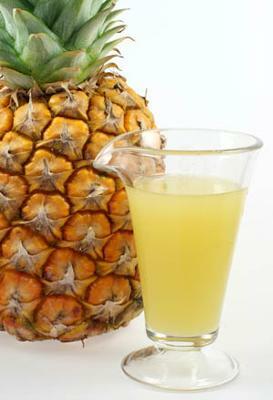 That wraps up this pineapple juice article on how to extract the sweet nectar. We hope you enjoyed reading it. Don't forget to check out our many pineapple juice based recipes. Join in and write your own page! It's easy to do. How? Simply click here to return to Juicing For Health.